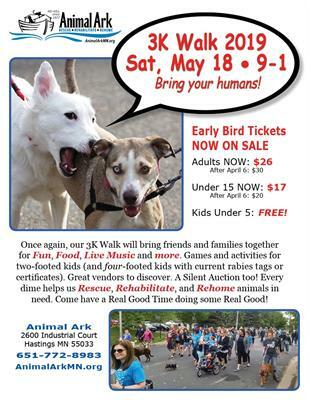 Animal Ark 3K Walk - 5.18.19 - May 18, 2019 - Hastings Area Chamber of Commerce & Tourism Bureau, MN ? 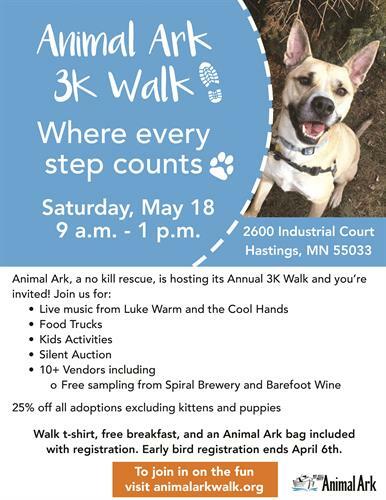 Event Details: Live Music, food trucks, wine sampling from Barefoot Wine & Bubbly, beer tasting from Hastings Spiral Brewery, vendors, kids games, dog training demos, goodie giveaways, silent auction, 25% off all animal adoptions (excluding puppies & kittens) along with a visit from the Hastings Fire Truck & Dakota County K9 officer, Rex! Our event fundraising goal is $15,000. 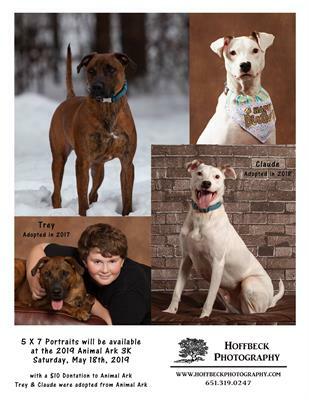 The funds raised will not only enable us to continue to provide our animals with food, shelter and medical care, but it will help us to meet their social and behavioral needs as well. Can't participate in our walk, but still want to donate to the cause? Your donation in any amount makes all the difference to our animals! Once again, our 3K Walk will bring friends and families together for Fun, Food, Music and more. Well behaved pets are welcome too but pet owners need to show proof of vacinations to keep every pet safe. Great vendors to discover, food trucks and a silent auction too. 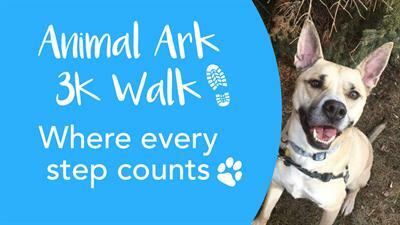 This walk helps us to Rescue, Rehabilitate, and Rehome animals in need. Order tickets in advance, with walk T-shirt included as detailed in tickets on EventBrite. Walkers welcome on day of event too, fee payable at registration. 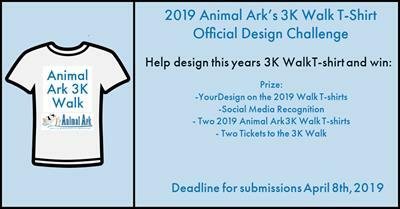 We are also interested in becoming a sponsor or vendor and to participate in this event, or donate an item for the silent auction please contact Janet Wyman at jwyman@animalarkmn.org.